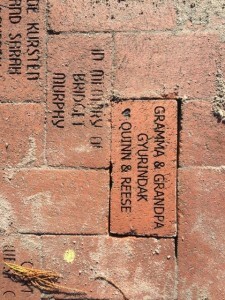 TIMING: It can take up to 8 weeks from the time we receive your oder until the time the brick is installed. Although we are sometimes able to install sooner than that, we don’t control the engraving or installation process, and we cannot rush it deliberately. 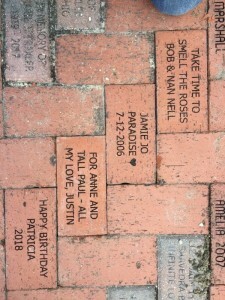 NOTIFICATION: We publish photos of installed bricks here on our website, on Facebook, and in our monthly email blast. Due to volume, we are unable to notifying brick patrons individually. ENGRAVING RULES: Lee County prefers that we no longer engrave “memorial language”, so use words like “Dedicated to…” or “In honor of…” instead. The County and Foundation reserve the right to reject any engraving request either organization deems inappropriate. 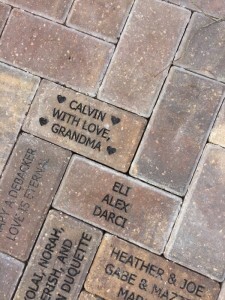 DONATION AMOUNT: Effective 01-01-2019, the donation amount for an engraved brick is $75; you can download a brick engraving form by clicking here. You can mail the form to the address printed on it, OR you can pay online and email the form. You can pay online by clicking here. Scan it, take a photo, whatever works for you – as long as we can read your information, pay online and then email your brick form to INFO@LakesPark.org – save a stamp!